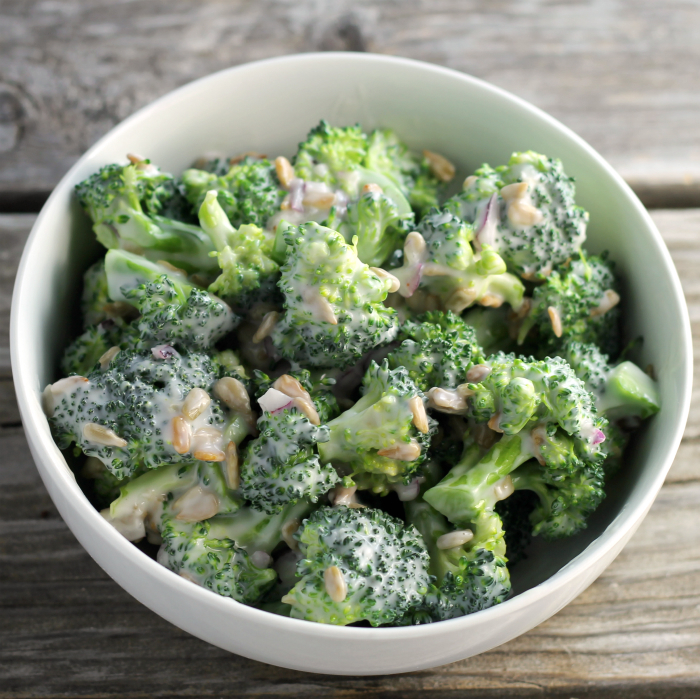 Creamy broccoli salad has a little bit of sweetness, but a little bit of tangy also; it’s so good! I am trying to add more green to my diet. During the winter months, it is so easy to get caught in all the great comfort foods and totally forget about the healthy foods or at least for me. So, I have been adding healthy lettuce and spinach salads to my dinners. Once in a while, I like to sneak in other types of salads. I do love my sweet and tangy salads. I make these salads with salad dressing, not mayonnaise; I like the flavor of salad dressing over the mayonnaise, I think that it has a bit more flavor. I know that does not make for a healthy salad, so this time, around I replace some of the salad dressing with yogurt. Yeah, I do know that the plain yogurt does not add sweetness such as the salad dressing, but I do like the creaminess that it adds and the tang it also brings. I kept it simple I added some red onion and sunflower seeds for a little crunch with the broccoli. I am going to say that this not as healthy as my lettuce and spinach salads, but it is a nice change, which we all need once in a while. 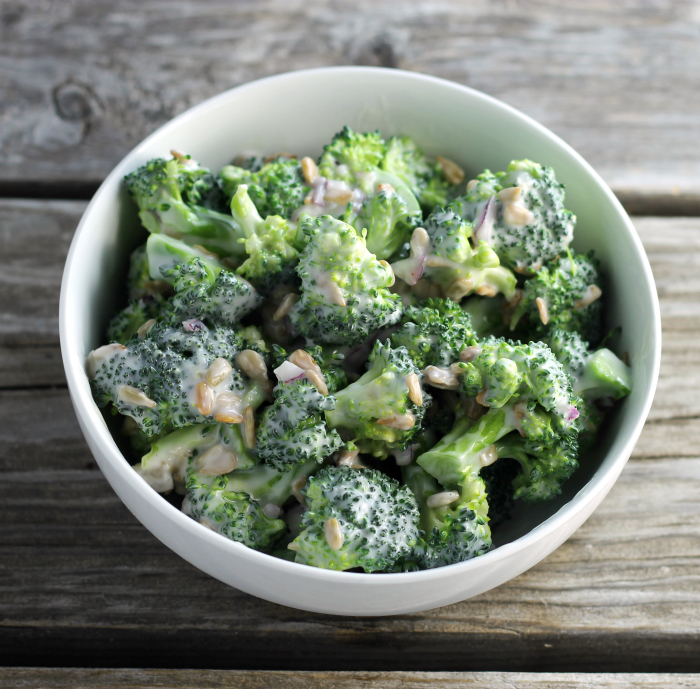 I hope you enjoy this cream broccoli salad. Cut the flowerets of the broccoli head into bite size pieces. Wash the broccoli and dry thoroughly. Combine the flowerets, onion, and sunflower seeds. In another bowl mix together the salad dressing, yogurt, sugar, and white wine. Beat until well combined. Pour mixture over the broccoli and toss until the broccoli is well coated. I would devour the whole bowl, Dawn. I totally love broccoli! My daugther love broccoli ! I have to make this recipe ! 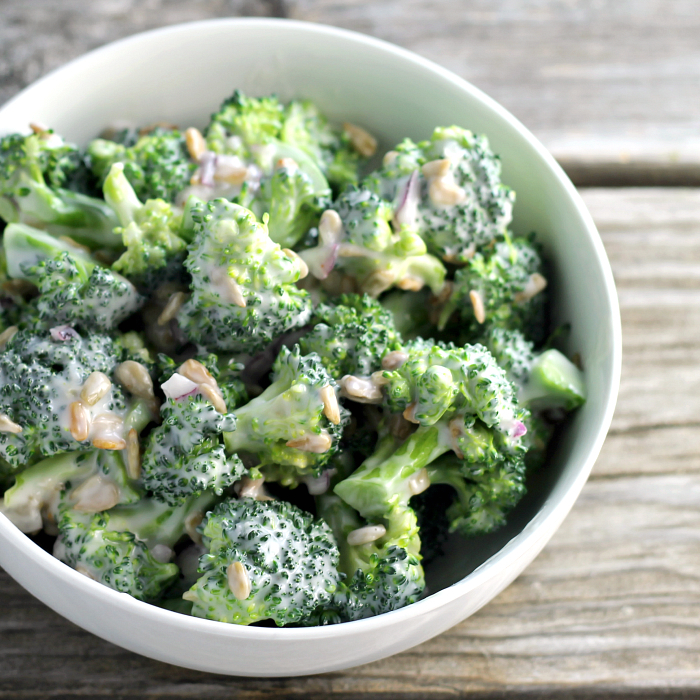 I love creamy broccoli salads! That’s a great way to get more broccoli in your diet! Your salad looks delicious! I love this salad! It’s dangerous to have around as I could eat the whole bowl myself! Broccoli tastes better to me if it’s been steamed briefly, but it has more vitamins and other valuable nutrients raw, so this looks like a very healthy salad! Honestly I am not a big fan of raw broccoli, but looking at your creamy broccoli salad, I would without hesitation have a big serving of it. There definitely is a comfort food trap at this time of the year, isn’t there? Too easy to eat a bit too heavy. So green stuff is definitely needed to save ourselves from ourselves! This is just excellent — thanks.